Squash vine borer moths are day-flying ‘clear wing’ moths with a 1.0 to 1.5 inch wingspan, black forewings, clear hind wings, and a bright orange abdomen. In flight, they look like wasps. There is one generation each year and adults emerge in late June/early July. Eggs are oval, redish brown in color, and glued to the stem or petiole. The large cream-colored larvae are 1 to 1 1/2” long and 3/8” wide. The pupae survive the winter 1 or 2” deep in the soil. Spring or fall plowing buries pupae deep in the soil and reduces survival of overwintering populations. Preferred hosts have thick stems, while thin stemmed squashes tend to be more resistant to attack. 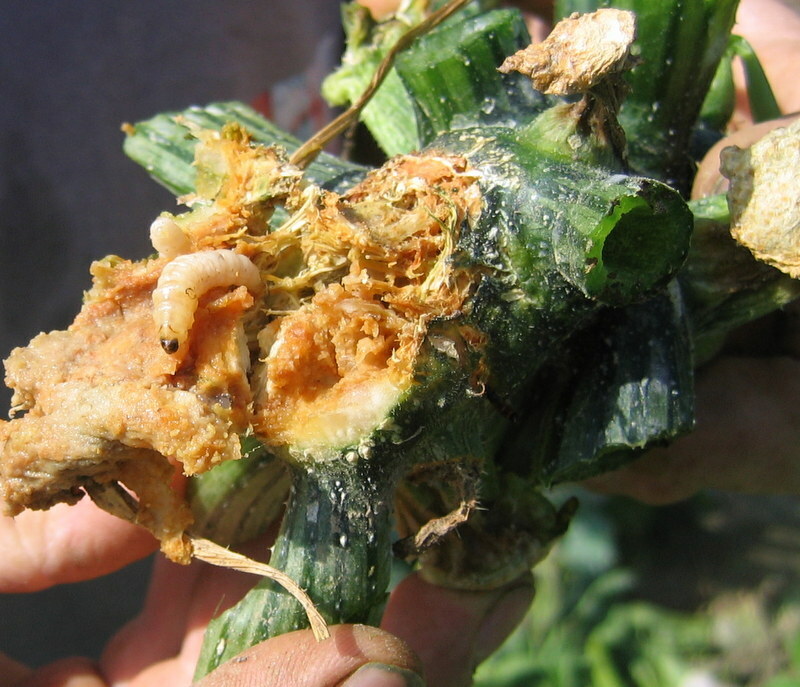 Yields of summer squash can be reduced by 1/3 if infestations exceed 5 larvae per plant. Typically growers first notice this pest in July and August, when vines wilt during the heat of the day, and upon closer inspection find frass and feeding holes. 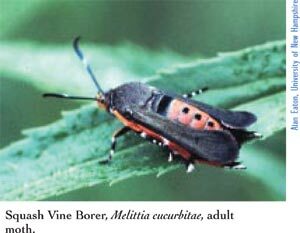 By the time wilting is observed, it is likely too late to do anything, so scouting fields and using pheromone traps to montior adult flight is imperative where this pest is established. Winter squash, pumpkins, and zucchini are most susceptible while butternut squash is resistant. Growers should scout their pumpkin and squash fields weekly for squash vine borer from late June through early August, or when 900 base 50ºF growing degree days have accumulated. Examine the base of vines for evidence of larval feeding (sawdust-like frass near entrance holes) and then split open the stem to confirm the presence of larvae, which suggests more eggs are being laid. Alternatively, flight of adult moths can be monitored using pheromone baits in traps placed just above the plant canopy. The best kind of trap to use is a large, cone-shaped net like the Scentry Heliothis traps but a bucket-type of trap or yellow sticky cards can also be used. When 5 moths per week are captured, pesticide applications should be initiated. Destroy vines soon after harvest to destroy larvae still in stems. This is especially important where multiple successions are present in an affected field. Plowing crops to bury residue deeply will lower survival of overwintering pupae. Keep plants protected with floating row cover from transplant to flowering. Timing sprays to target larvae as they hatch out of eggs is very important. Sprays should be directed at the plant bases, at crown or runners. Materials used for control of hatching SVB larvae include pyrethrins, pyrethroids, carbaryl, as well as Bacillus thurigensis (Bt) toxin formulations, especially those made from B. aizaiwi. Make 2 to 4 weekly applications when more than 5 moths per week are captured in pheromone traps (check Vegetable Notes pest alerts for trap count data throughout the growing season), when eggs are observed, or when 900-1000 GDD base 50ºF have accumulated. For current information on production methods (including varieties, spacing, seeding, and fertility), weed, disease, and insect management of cabbage, broccoli, cauliflower and other Brassica crops, please visit the New England Vegetable Management Guide website.